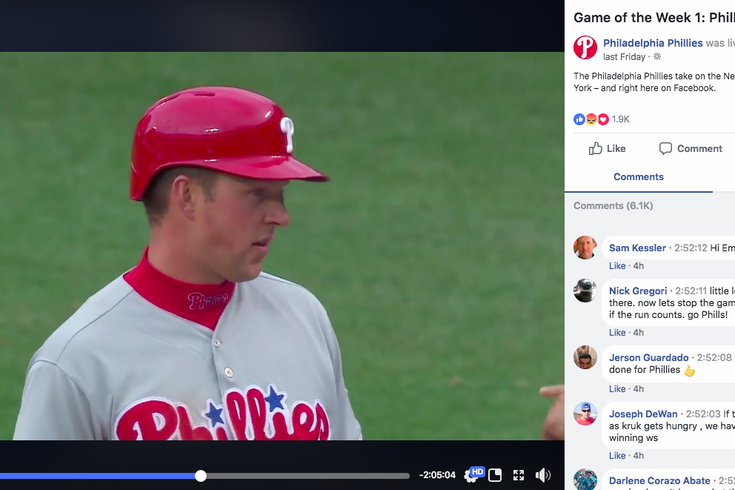 It's Phillies star Rhys Hoskins, but on Facebook. A bunch of you squares couldn't stop whining and moaning about Wednesday afternoon's Phillies game streaming exclusively on Facebook. Well, buckle up, ya old farts, cause Mr. Millennial is here to tell you why it was actually the bee emoji's knees. Watching Phillies games on television is boring and stupid. When I watch on what is considered the sport's traditional platform for viewing, sans actually attending the game (who has time for THAT? ), all I get to see is slow, sad baseball, and maybe the occasional insight on what cold and warm temperatures feel like from Gregg Murphy. But on Facebook, I get all these sick — see the cool definition — little online stickers that tell me how I'm supposed to feel about baseball. Now, I don't even need the announcers. Thanks to those little smiley faces and hearts and sad faces that pop up next to the players, I can listen to a podcast about the revival of dad sneakers so I don’t fall asleep between pitches. Check it out: Aaron Nola gave up two runs. Crying face emoji! Even better than Facebook's sad/happy indication system are the comments. Holy heck, the beautiful comments. It's as if an older family member's Facebook profile and an angry SportsRadio WIP caller teamed up to barrage my eyeballs with LOUD THOUGHTS about SPORTS GAMES and ALSO I AM SELLING TAMALES WOULD ANYONE LIKE SOME? Plus, the dang government ain't got no jurisdiction on these here internet parts. That means John Kruk is allowed to imply that he may or may not have locked himself in a secret dugout room during his playing days and had a little bit of "me time" whenever there was a rain delay. Finally, by watching the game on Facebook, I get to let Facebook watch me! That way they can calibrate my profile by tracking my viewing habits – information they will never, ever accidentally share with a third party. Can't wait for April 26, when the Phillies play the Diamondbacks in a game you can only get on the 'Book. FUTURE!